There’s no doubt that toddlers are often a bundle of energy. We welcome that energy and excitement because we know that it’s a natural part of growth and learning. We’ll channel that energy into positive learning experiences, giving them plenty of room to move and explore. We provide nurturing guidance as they develop physical skills and master emerging milestones. Individual Growth and Development: Our exceptionally low ratio between caregivers and toddlers ensures that your baby will receive the optimum care, attention and opportunities for development. Reading aloud from a large collection of books helps to develop children’s receptive language and imagination. It also builds a foundation for literacy learning. 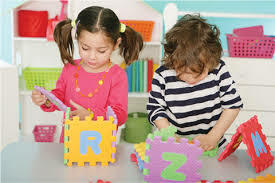 At Small World Learning Center we select books, toys learning tools and other accessories that invite toddlers to participate by posing simple questions, repeating sounds, rhymes and refrains. Each child is different and will develop and mature at different rates. With this in mind, our teachers will observe and record each child's development throughout the year. Philosophy of Balance: Our low ratio between teachers and toddlers ensures a safe and a fully balanced day in a caring atmosphere. The individual attention with consistent routine and stimulating activities gives toddlers a sense of security and encourages exploration and learning environment around them. Expressive Language Development: Small World Learning Center uses American Sign Language (ASL) to improve the way parents and teachers interact with toddlers. Using simple signs, our toddlers are able to communicate with their needs, wants and observations in a manner that adults can understand. Books, songs, playing, sounds and activities are used at all times so that toddlers will be encouraged to work on their verbal communication skills.